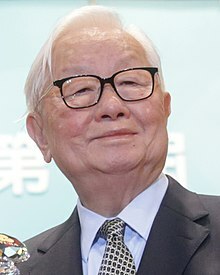 Morris Chang (Chinese: 張忠謀; pinyin: Zhāng Zhōngmóu; born 10 July 1931), is an American businessman in Taiwan and the founder, as well as former chairman and CEO, of Taiwan Semiconductor Manufacturing Company (TSMC), the world's first and largest silicon foundry. He is known as the semiconductor industry founder of Taiwan. Chang was born in Ningbo, Zhejiang. When he was young, he wanted to become a novelist or journalist. However, his father, an official in the Yin county government, persuaded him otherwise. In 1948, as China was in the height of the Chinese Civil War, a year before People’s Republic of China established, Chang moved to Hong Kong. The very next year he moved yet again to the United States to attend Harvard University. He transferred to the Massachusetts Institute of Technology and received his bachelor's and master's degrees in mechanical engineering from MIT in 1952 and 1953, respectively. After leaving MIT without obtaining a PhD, he was hired by Sylvania Semiconductor, then just known as a small semiconductor division of Sylvania Electric Products, in 1955. Three years later, he moved to Texas Instruments in 1958, which was then rapidly rising in its field. After three years at TI, he rose to manager of the engineering section of the company. It was then, in 1961, that TI decided to invest in him by giving him the opportunity to obtain his PhD degree, which he received in electrical engineering from Stanford University in 1964. During his 25-year career (1958–1983) at Texas Instruments, he rose up in the ranks to become the group vice president responsible for TI's worldwide semiconductor business. He left TI and later become president and chief operating officer of General Instrument Corporation (1984–1985). Chang worked on a four-transistor project for TI where the manufacturing was done by IBM. This was one of the early semiconductor foundry relationships. Also at TI, Morris pioneered the then controversial idea of pricing semiconductors ahead of the cost curve, or sacrificing early profits to gain market share and achieve manufacturing yields that would result in greater long-term profits. After he left General Instrument Corporation, Sun Yun-suan recruited him to become chairman and president of the Industrial Technology Research Institute. As head of a government-sponsored non-profit, he was in charge of promoting industrial and technological development in Taiwan. Chang founded TSMC in 1987, the beginning of the period where firms increasingly saw value in outsourcing their manufacturing capabilities to Asia. Soon, TSMC became one of the world's most profitable chip makers. Chang left ITRI in 1994 and became chairman of Vanguard International Semiconductor Corporation from 1994 to 2003 while continuing to serve as chairman of TSMC. In 2005, he handed TSMC's CEO position to Rick Tsai. In June 2009, Chang returned to the position of TSMC's CEO once again. On June 5, 2018, Chang announced his retirement, succeeded by C.C. Wei as CEO and Mark Liu as chairman. Chang was awarded the Order of Propitious Clouds, First Class in September 2018. In 2018, Chang was appointed as the Presidential Envoy of Republic of China (Taiwan) to APEC. This is his second time serving, the first time being in 2006. 1999, "Exemplary Leadership Award" from the Fabless Semiconductor Association (now Global Semiconductor Alliance), the first recipient of the award; now the award bears his name, "Dr. Morris Chang Exemplary Leadership Award"
2000, IEEE Robert N. Noyce Medal for Exceptional Contributions to Microelectronics Industry. 2007, Received the Computer History Museum's Fellow Award, for dramatically accelerating the production of semiconductor-based devices and systems by developing an independent semiconductor manufacturing foundry. 2011, IEEE Medal of Honor. ^ "Asia's New Billionaire; China Sperm Count: Evening Briefing Asia". Bloomberg. 13 July 2017. Retrieved 22 July 2017. ^ School of Engineering. "Morris Chang — founding chairman of Taiwan Semiconductor". California: Stanford University. ^ "Oral History Interview: Morris Chang". SEMI. Retrieved 5 June 2018. ^ Tsai, Terence; Cheng, Borshiuan (2006). The Silicon Dragon: High-tech Industry in Taiwan. Edward Elgar Publishing. p. 92. ^ Wang, Lisa (2013-11-13). "TSMC says Morris Chang is retiring as CEO — again". www.taipeitimes.com. The Taipei Times. Retrieved 2018-06-20. ^ "Back to the future for TSMC's new CEO". Taiwan Today. Ministry of Foreign Affairs, Republic of China (Taiwan). 2009-06-12. Retrieved 2018-06-20. ^ Horwitz, Josh (2018-06-05). "After spawning a $100 billion industry, Taiwan's "godfather" of computer chips is retiring". Quartz. Retrieved 2018-06-20. ^ Chang, Chien-chung; Huang, Frances (June 5, 2018). "It's official: TSMC's Chang retires after board reshuffle". ^ "TSMC founder receives Order of Propitious Clouds". Taipei Times. 14 September 2018. Retrieved 14 September 2018. ^ "Morris Chang '52 Life Member Emeritus". MIT. Retrieved 5 February 2015. ^ "Kung fu novelist Jin Yong to receive honorary degree". Taipei City: Taipei Times. Central News Agency. 2007-05-08. Jin Yong will be one of three people to be awarded honorary doctorates in an event marking NCCU's 80th anniversary. The other two are Cloud Gate Dance Theater founder Lin Hwai-min (林懷民) and Taiwan Semiconductor Manufacturing Co chairman Morris Chang (張忠謀). ^ "Asia University, Taiwan 歡迎光臨亞洲大學全球資訊網". www.asia.edu.tw. Retrieved 2018-02-12. ^ "IEEE Robert N. Noyce Medal Recipients" (PDF). IEEE. Retrieved 12 May 2011. ^ "Computer History Museum Names Morris Chang, John Hennessy, David Patterson and Charles Thacker to List of Fellow Award Honorees; Celebrates Twentieth Anniversary of Fellow Award Program". Computer History Museum. Retrieved 23 May 2013. ^ "IEEE Medal of Honor Recipients" (PDF). IEEE. Retrieved 23 February 2011. This page was last edited on 5 April 2019, at 22:01 (UTC).